El Capitan (Spanish for The Captain, The Chief) is a vertical rock formation in Yosemite National Park, located on the north side of Yosemite Valley, near its western end. The granite monolith extends about 3,000 feet (900 m) from base to summit along its tallest face and is one of the world’s favorite challenges for rock climbers and BASE jumpers. The formation was named “El Capitan” by the Mariposa Battalion when they explored the valley in 1851. El Capitan (“the captain”, “the chief”) was taken to be a loose Spanish translation of the local Native American name for the cliff, variously transcribed as “To-to-kon oo-lah” or “To-tock-ah-noo-lah” (Miwok language). It is unclear if the Native American name referred to a specific tribal chief or simply meant “the chief” or “rock chief”. In modern times, the formation’s name is often contracted to “El Cap”, especially among rock climbers and BASE jumpers. The top of El Capitan can be reached by hiking out of Yosemite Valley on the trail next to Yosemite Falls, then proceeding west. For climbers, the challenge is to climb up the sheer granite face. There are many named climbing routes, all of them arduous, including Iron Hawk and Sea of Dreams, for example. El Capitan is composed almost entirely of granite, a pale, coarse-grained granite emplaced approximately 100 mya (million years ago). 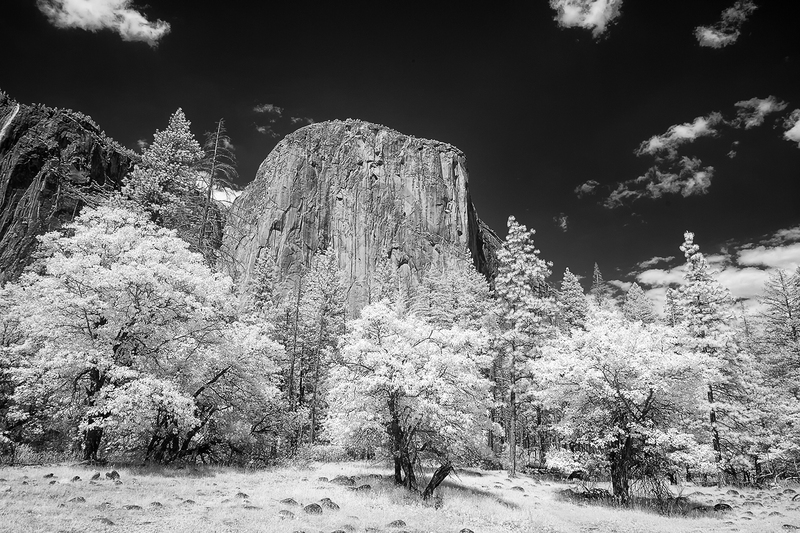 In addition to El Capitan, this granite forms most of the rock features of the western portions of Yosemite Valley. A separate intrusion of igneous rock, the Taft Granite, forms the uppermost portions of the cliff face. A third igneous rock, diorite, is present as dark-veined intrusions through both kinds of granite, especially prominent in the area known as the North America Wall. Along with most of the other rock formations of Yosemite Valley, El Capitan was carved by glacial action. Several periods of glaciation have occurred in the Sierra Nevada, but the Sherwin Glaciation, which lasted from approximately 1.3 million years ago (mya) to 1 mya, is considered to be responsible for the majority of the sculpting. The El Capitan Granite is relatively free of joints, and as a result the glacial ice did not erode the rock face as much as other, more jointed, rocks nearby. Nonetheless, as with most of the rock forming Yosemite’s features, El Capitan’s granite is under enormous internal tension brought on by the compression experienced prior to the erosion that brought it to the surface. These forces contribute to the creation of features such as the Texas Flake, a large block of granite slowly detaching from the main rock face about halfway up the side of the cliff. Once considered impossible to climb, El Capitan is now the standard for big-wall climbing. “El Cap” has two main faces, the Southwest and the Southeast. Between the two faces juts a prow. While today there are numerous established routes on both faces, the most popular and historically famous route is The Nose, which follows the south buttress.